When “Flaming” Frank Pedregon passed away in 1981, he had no idea his sons would become some of the most respected drivers in Funny Car. Fast forward to 2016, and one son Tony has 43 event wins, third on the all time win list, and two championships, and the other Cruz has 33, and two championships, including the only Funny Car championship not won by John Force. The Pedregons have gone down as one the greatest families in the history of drag racing. The first brother to have real success in Funny Car was Cruz. He started racing in 1987 in a top alcohol dragster, moved to top alcohol funny car, then to top fuel in 1991, and in 1992 won the Funny Car championship. The biggest rivalry in drag racing in the 1990’s was John Force vs. Cruz Pedregon. Cruz retired in 2001, and served as a color commentator for ESPN’s NHRA telecasts. In 2002, he returned to the track as an owner/driver, driving the Advance Auto Parts Pontiac Firebird. After switching to Chevy with some success, he started driving a Toyota in 2008. That was the same year that the race distance was shortened to 1000 feet. Cruz would win the last three races of the season, and won his second NHRA Mello Yello Drag Racing Series Funny Car Championship. 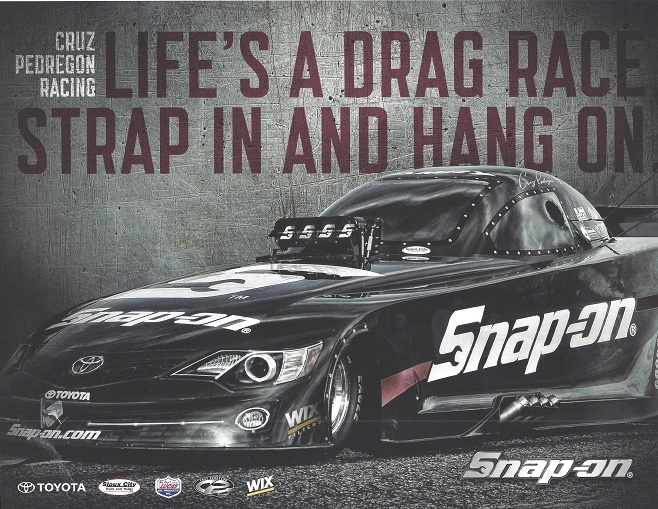 In 2011, Cruz picked up Snap On Tools as a sponsor, which he still carries today. I had the chance to interview Cruz about his racing uniform. DGF-From a driver’s perspective, how would you like your suit to fit? Cruz-Well let me put it to you this way, I’m a proponent of comfort, and suits are not meant to look good walking around. Suits are meant to be comfortable while you are in the car, assuming the position so to speak. I’m a believer in having a looser fitting suit, while you are in the car. I’m a fan of loose fitting clothes in general, I wear my pants loose, everything loose, you know what I mean? A lot of people get caught up in how it looks walking around, but that’s not the goal. The goal is to have it comfortable in the tight confines of a race car, where there is little to no movement. There is probably less movement in a funny car than any other kind of race car. We’re not asked to “saw the wheel” as they say, we have a very limited space. Every inch is taken up, and there is very little space to fit the driver. DGF-How do you rotate suits, helmets, shoes, gloves, etc over a race weekend? As far as helmets, I’ll go with the paint scheme, or whatever I feel is right. I have half a dozen helmets that I carry with me, different designs, whatever the scheme calls for, whatever I feel like. Let’s say we’re in a part of the country, where there are some Raider fans or anti-Raider fans, in Denver, I’ll bust out my Raiders silver and black helmet, at those events. Bell does a great job with my helmets, they are all identical. I’ll switch them, and can’t tell I’m wearing a different helmet. As far as accessories, as they need to be cleaned, I’ll riffle through them. When it comes to my gloves and fire boots, I’ll wear them for two races, and then get them dry cleaned. If we are in a three race stretch, I’ll go to my spares. DGF-You mentioned your Raiders helmet. As we know, the NFL is very protective of their trademarks. Have you had to deal with issues from the NFL? Cruz-No I haven’t, and I’m very aware of that. Dealing with sponsors through the years, they are protective of that. I was with McDonald’s for seven years, and there is probably no corporation that protects the arch like that company does. I’m aware of it, and thankfully so. I’m a Raiders fan, and I know some of the Raiders, I know some of the people in the organization. So I do have a connection with them. I visit them every year. You know, it all started with Joe Gibbs, the three time Super Bowl winning coach. I forget the exact program, but we had different helmets from the NFL. We had all authentic stickers and everything. My teammate Corey Mac [McClenathan] had a Vikings helmet. So I chose to stick with the Raiders, I never had anything else painted. My painter painted, and they provided me with the helmet stickers, and the center stripe, in a thick guage plastic vinyl. This was back in the mid-90’s. Ever since then, I’ve felt like I had a connection with the Raiders. I’m still friends with Joe Gibbs to this day. Those are my colors, and if they tell me not to have it, it’ll still be silver and black. DGF-Some drivers black out parts of their helmet visor to cut down on distraction, which Jack Beckman referred to as “the Clydesdale effect.” I have noticed that you prefer to have your whole visor clear, have you tried the Clydesdale effect? Cruz-I did, but honestly, to me, if your susceptible to that, you probably have something else going on. Part of your God given ability to focus, to me should be, even if something is in your vision, your focus should be the thing you are focused on, not things on the outside. I did try that at one time, and all it did was verify that I’m really screwed up. DGF-When the HANS device first became mandatory, how hard was it adjusting to it? Cruz-It was awkward at first. Then I remember thinking put it on and take it off out of the car. The design of them, especially the latest greatest one, called an “R3,” Simpson makes it, and it straps to your body. The original HANS was the one that they stuck on your neck, and the straps of your shoulder harness went over it, so when you took your harness off, it came off too. The one I like, and I’ve been using for years has its own independent straps, and I can get out of the car. It still straps to the harness, and tethers to your helmet. I forgot it one time, and I felt completely naked. I got out of the car, and I thought “I’m missing something.” It took six months, but now it’s a part of the uniform. DGF-You used to wear a helmet that had respirators in them, why did you make the change to standard helmets? Cruz-The change was made for me, due to the lack of availability of that helmet. The respirator concept is one that I would like to pursue in the future. For my application for the Nitro Funny Cars, that environment requires a respirator system of some sort in there. I just haven’t gotten around to talking and working with Bell. That was something that Impact did for us back in the day. It had no fire restraint qualities to it whatsoever. It was like a paint mask, which was good for the fumes, that the Nitro puts out, but it never had any safety qualities to it. When I switched from Impact to Bell, I never pursued it. Maybe the firefighting industry has something that could work. It’s probably the last thing I would need to feel `100% safe. The fire danger is an element we have in our type of racing, more than any other auto sport. DGF-You also race dirt track, what is the difference in SFI ratings for a Funny Car and a dirt track firesuit? Cruz-From my understanding, there’s quite a bit. My Funny Car suit is 5 layer. My dirt track is of the 2 layer variety. Less is more, it’s so much more comfortable. It’s like putting on a pair of sweats. When I went dirt track racing, thin suit, no respirator, different type of car, different dangers. DGF-Do you keep any memorabilia from your career? Cruz-I have quite a bit of boxes, one day I’ll get around to building a room. I have literally pallets of it, stored away, some of it is in the office, some of it is in the shop. The main thing for me is helmets. I’ve always had a thing for helmets, and I’ve sold more than I want to admit through the years. I’ve sold 20-25 helmets, and I have just as many or more, 20-25, and that number grows every year. I’ve never been one to have a single design, like F1 guys, if it’s their country or whatever. It’s kind of a cool idea, but I’ve always felt like, either something that matches the car, or something that represents something important to me. DGF-What is the strangest thing you have every autographed, or been asked to autograph? Cruz-Everytime I think of one, it gets outdone at the next event I go to. I signed a bowling pin once. Another time, a guy took his aritifical leg off, leaned on the trailer, handed it to me to sign. While Cruz is still a full-time owner driver, he is also a dirt track racer in his spare time. He’s also a huge boxing fan, and lists Muhammad Ali as one of his idols. He also has his own brand of habanero hot sauce, Cruz Pedregon’s El Cucuy Hot Sauce. He is a die hard Oakland Raiders fan, and uses Raiders imagery in his uniforms and cars. At an age where many drivers hang their helmets on the mantle, Cruz is still tearing up the NHRA, and shows no signs of stopping soon. Next week, some medical memorabilia.